19 May It’s the Terrible 2’s. Well, ladies and gentlemen, Happy Birthday to us. We’re going to do this up right, again, so plan to spend some quality time in Okoboji. 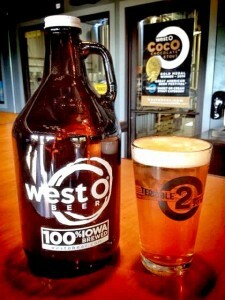 At noon, we give away 100 of our commemorative glasses like the one you see in the photo. We give you the glass, you’re on your own for the beer. That’s noon, and not a minute earlier. And you gotta be in line. Say hello to a fresh batch of Honeysuckle Saison. Free pizza at 6. While it lasts. There. Will. Be. Games. State-of-the-art beanbag toss. There will also be beer. Karl has made sure of that. Speaking of Karl: Brewery tours by Head Brewer Karl at 1, 3, and 5pm. Live music times 2: from 2-5pm it’s the South 71 Trio. And 7-10pm, David Lee returns and sends us this note: “I’m looking forward to having my friend, Rob Ashe of BOOTS along with me. He brings a great bluesy and roots feel to the show with his resonator slide & chicken pickin’ guitar style.” We can’t wait. Oh yeah, say hello to a new growler too. You asked for a less expensive alternative to our famous stainless steel growler, so here it is. If you keep filling it with OUR beer, you are guaranteed it will be 100% Iowa Brewed™. That’s marketing talking. Growler Dog will be doing his thing. Chat over a beer with the owners, head brewer, tasting room manager, and marketing monkey. Free advice, yo. Even from the monkey. It’s as good a time as ever to also remind you of summer hours. They start right after Memorial Day, including three days a week of opening at noon. Random Acts of Beer. Translation: free stuff. More, more, we’re sure there will be more. It’s like last year, only better. West Okoboji, FTW.